“You take the Blue Pill – the story ends, you wake up in your bed and believe whatever you want to believe. — Morpheus to Neo in ‘The Matrix’. Do you want to know the truth? If these pills related to animal farming, which one would you choose? Do you have an image in your mind of a kind farmer caring for his flock? Perhaps as a youngster you saw lambs or calves frolicking in green fields. There is something soothing about seeing a herd of cows peacefully grazing in a sunny meadow. We can’t help but smile when we see a mother hen trying to control her recently hatched chicks as they explore their new world. 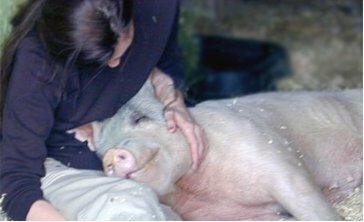 Are you interested in introducing compassion into your life, but will not give up your belief that animals are happy to be farmed? You are more than welcome to explore Elated. You will find mealplans, health advice and recipes galore; you are even invited to transition towards a vegan diet without ever once being confronted with the truth behind animal farming. We will honour your choice and offer you a safe space to re-connect with your inner value systems in your own time. However, choosing the Happy Farming ‘Blue Pill’ may be costing you more than you are willing to pay. Think carefully about the implications of coping with your cognitive dissonance before making your choice. We have an uncanny ability to compartmentalise our value systems and memories. This is a coping mechanism we use to reduce cognitive dissonance. Here follows a practical example. At some stage in our life, a seed of doubt is sown as our logical mind perceives it is impossible to raise the sheer volume of animals who are slaughtered every day, on the happy farms we have visualised. 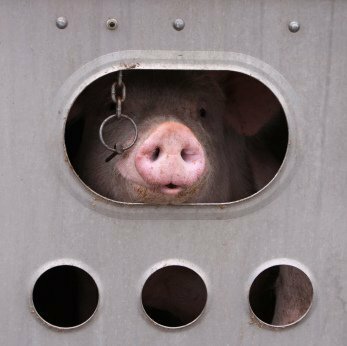 In the instant we become aware that animals are sentient and feel pain or joy, we immediately feel responsible for their suffering and question our right to eat them. or our behaviour of eating animals. The behaviour of eating animals is the most difficult element to change, particularly because society has an already entrenched paradigm where animals are legally classified as objects, property and resources. Therefore, yes it seems to be easier for us to change our beliefs and feelings to make us feel more comfortable about eating farm animals, while still loving our pets. But at what cost to ourselves? We set about compartmentalising the value systems we apply to farm animals and keep them separate from those we apply to domesticated animals. The required repression of our internal debate carries an emotional toll. Every instance where we question our actions and deny our own desire for moral consistency, will stack up until they reach a tipping point. Our refusal to acknowledge the truth, that we already know, will one day be overpowered by a flood of realisations, resulting in a tsunami of guilt. Have you ever noticed how quick off the mark we are at defending ourselves when we know we have chosen an indefensible position? A large amount of our emotional energy is diverted to strengthening our resolve to be inflexible on the issues we feel most conflicted over. This effectively crushes our spontaneous social interaction and forces us to continuously second guess ourselves. Have you ever told a small white lie that started to spiral out of control and became more complicated the longer you tried to keep it alive? With cognitive dissonance we are telling ourselves the lie and it takes energy to enforce a strict policy of avoiding any discussion or thought process that would threaten the paradigm we have chosen to be aligned with. As food plays a role in almost every activity in our daily lives this would happen often, and we would need to be on constant alert. Early warning signs that you are repressing feelings of guilt include mood swings, low self-esteem, exhaustion, being hyper-critical of others, defensive and aggressive behaviour, paranoia, self sabotaging and self-defeating actions and, according to Freud, slips-of-the-tongue and physical accidents almost always point to suppressed guilt breaking free from self-imposed constraints. Facing the truth and acknowledging your own culpability in the suffering of animals might cause you a little discomfort now, but in the long run, avoiding it could cause bigger problems that manifest as neurosis and aggressive behaviour. As Carl Jung said, ‘Neurosis is always a substitute for legitimate suffering’. What suffering is more legitimate than acknowledging our own responsibility for causing suffering in others? Imagine what a relief it would be to just let it go: simply stop struggling to keep your carefully constructed worldview intact. Vegan education is not only about saving animals; it is also about liberating people from the web of deceit and lies they have become enmeshed in. There is a certain serenity that follows acceptance. Making a conscious decision to remove ourselves from the cycle of violence and be part of the solution is a life-affirming experience. At the end of the day, what is best for you is also best for the animals. Why delay the inevitable? Choose the Red Pill.